Minding my own business working at the StencilGirl booth with John Shaw I looked up to notice that the rest of our team was missing....Odd--where did they all go?? You can get Carolyn's version in THIS post. I can't really explain the rest. Let us just say that the StencilGirl Team is PASSIONATE...passionate about stencils, yes...but put more art supplies in front of us and oh my!! I don't think Susan Pickering Rothemel really knew what to think of all of us, LOL! Insert vision of Janet jumping up and down when Susan showed her how to do a technique. By the time we left Susan had filled our hands with product to play with and sent us on our way. WOW! Thank you Susan! Yes, I am a product driven girl! Possibilities GALORE! Susan was also nice enough to give us each a copy of her DVD so we could get familiar with her products. You can find it on her website. I'm thinking you may have come here for a technique or inspiration, so let's get started! Now I could do one of the techniques on Susan's DVD, but...instead I decided to "experiment" since I hadn't played with any of these products before. Pretty literally I started with a blank canvas....a 8.5" x 8.5" to be exact. It started to fray as soon as I cut it so I thought....hummm, PPA Adhesive I've never used that before...I'm thinking it just may work. It DID!!!! No fray here! Let's start with a stencil of course! I chose my Doodle It Layered Petals because I wanted something with large openings. I traced the stencil with a regular pencil onto the canvas and then cut out the negative parts of the stencil making sure to leave it still attached by the outside edge. TIP: cut slits in each "hole" to make removing the parts easier. This really isn't as hard as you might think. My idea was to work with the Dicrofibers so that they showed thru the cut out holes of the stencil. These are just beautiful and quite amazing the way they fuse together to make an actual material. They do tend to fly around a little (insert story of a son that wasn't too happy with me and how somehow they ended up in our dinner that night. What's a little sparky goodness in your food????! they come right on the package so no worries! 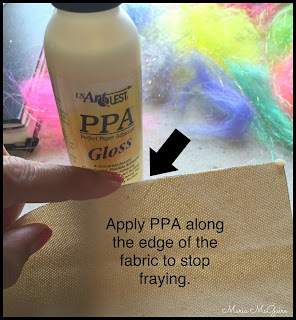 Now that I had my fiber "sheet" made I used the PPA Adhesive to adhere it to the canvas. I added glue to the back side of the my cut out canvas and attached the entire sheet over it. The final picture below shows what it looked like when done. What should I play with next......how about those little balls of awesome color! Prills (these were my favorite product I played with). I again added the PPA to the canvas, this time on the good side and aded the Prills. I walked away and let it dry overnight (not one of my strong suits). STOP! I love the Prills, but I hate my project!!!!! I literally sat there for 10 minutes and stared at it.....I knew what to do. I always do....it a little voice in my head that comes up--do this! I have learned over the years to just go with it. Heck, it is only "stuff" there is more where that came from. What did I hate?? The middle! TOO MUCH! CUT IT OUT! So that I did! Just that made me instantly happy and I new I was out of the uglies! Great Tape....I "think" Susan affectionately called it Buger Tape...either that or I'm dreaming. I used it to adhere a piece of felted wool to the back of the canvas to be the new middle. This stuff is sticky and wonderful!!!! Almost done...just a few finishing touches. 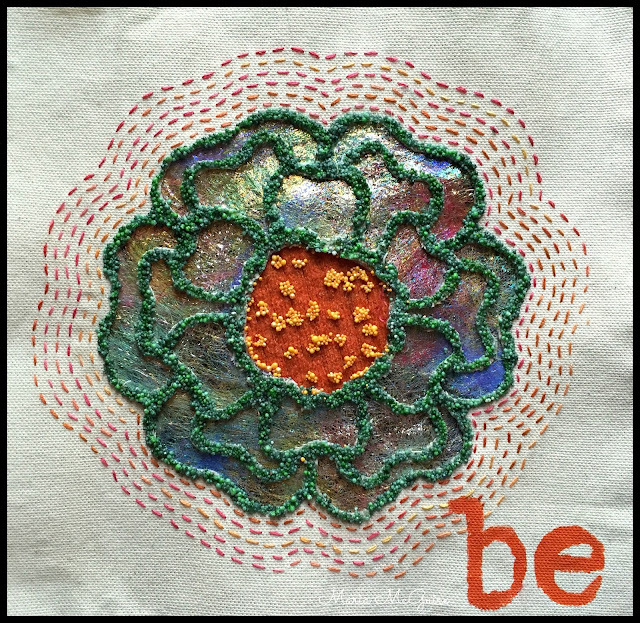 I wanted "be".....just be and it will come. I used the Vintage Typewriter stencil to make the word myself. This stencil comes in handy to me ALL the time! A few extra prills in the middle (because I was in LOVE with this color and had to use them) and then some simple stitching to bring all the colors together. Thanks Susan! 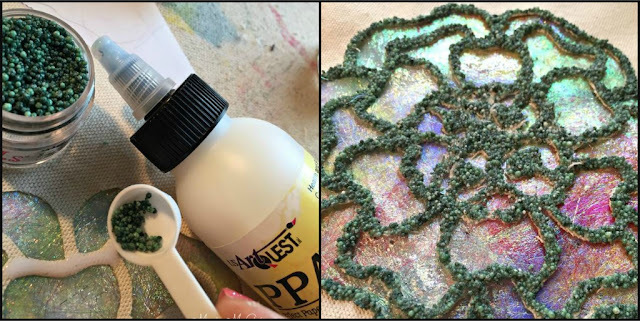 I had so much fun playing with these new to me products and am always thrilled to find a new way to use my StencilGirl stencils! USArtQuest supplies and StencilGirl stencils? Hop on over to her Blog to see!!!! Your project turned out BEAUTIFULLY, Maria! Your step-by-step process is GREAT! I wish I would have taken a picture of it Mary....I still smile when I think of it...him, not so much! I love that green and orange together! Beautiful! Your 'insert visuals here' are funny! I was totally thinking of YOU Janet when I put that wool in the middle! I didn't do anything with it yet Tasha. I was thinking along the lines of a pillow too :) Thanks for visiting! Very cool! I have not worked with fibers, similar to Dicrofibers, for a long time! I really like the multi colors. Great project, maria - I have new ideas now! So much texture! And your details! Wow! Love this! I love that you show the ugly and getting past it. And your stitching is so beautiful! The SG artists are so like my little art group. Each of us has a different talent and each mont one hosts an shows us a project. So fun. You always inspire me to do more. Your "fix" was amazing and I love the addition of the stitching--beautiful!!! Thanks Rebecca! I really love how it turned out in the end :) Thanks for visiting! 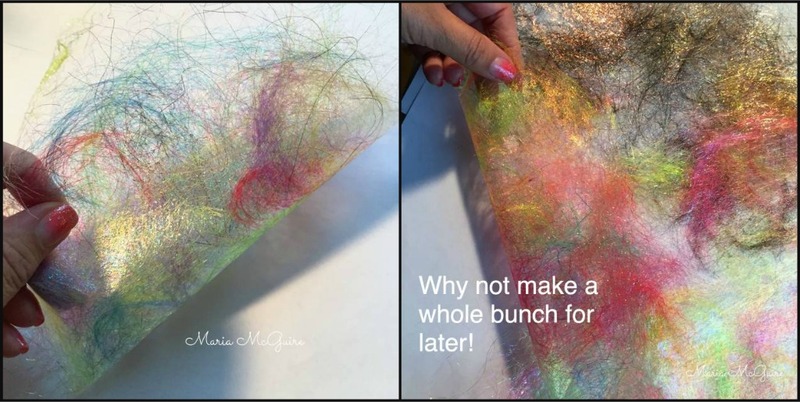 Fusible Fibers are so lovely, especially the way you combined them, Maria! This is a gorgeous project! I just love, love, love the look of the fiber and prills. I ordered some to try myself. It is so fun to touch Nadine! Make sure you show what you make :) I would love to see it! Wow. This looks amazing and was worth all the work! Love the colours and the shimmer! Hi, what a great stuf you made! I love how you take us with you in the process, the good and the 'oops'. I love the shining fibers, never seen that before. Loooove your step by step.. had never seen the fibers used or or the texture prills. starting a new wish list! Oh yum...edible art...what is your son's problem! LOL. This turned out beautifully! Loved reading about your process when you got to the "ugly" stage and how you proceeded from there. Thank you for sharing that! The hand stitching adds so much. What beautiful texture!! I can't wait to try these fibers! I love how textural this looks! The fibers and the prills will be a lot of fun to play with. I can use them on my greeting cards as well. You got beautiful flowers just by mixing the fibers. I love how you brought in all of the different mediums. I especially love the stitching you did at the end, I love to embroider and this has given me some new ideas. Thanks! I loved reading about your process, and the decisions that you made along the way. Although I like the satisfaction of a finished work, it's the process that I enjoy most. Thanks for sharing this. Your art is beautiful. Your work is always elegant, Maria! Thanks for sharing the process, and how you end up liking what hadn't worked very well. I can identify with that! So cool the way the fibers fused together! This is really fabulous. Thank you for sharing your magic. Love learning new products.Thanks for sharing ! Good job of saving your projecf. Love the prills. Absolutely love this.. the flower is so pretty. I love how you have left the word Be up for interpretation. It means something to you, and anyone who takes a look at your work can apply their own meaning. Great!!!!!! Love funky fiber stuff! This is great! I love your flower! I even liked it with the middle but adding the felt was definitely the thing to do. 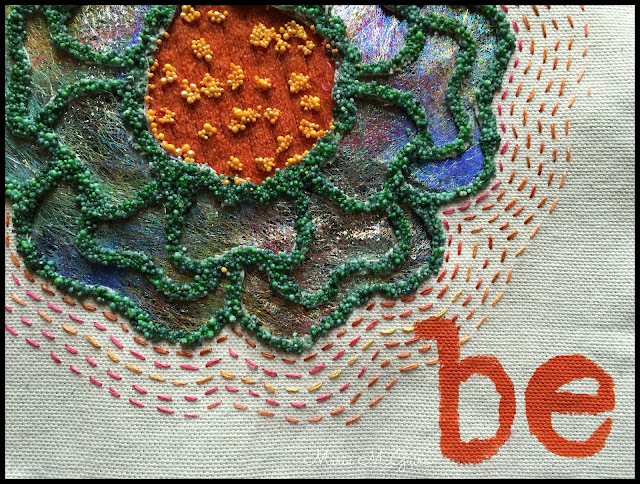 Love the stitching and of course the word. Awesome project. I am going to have to play with those prills and mini prills ! Great use of the fibers and prills! I love the way this turned out! Now, what are we making from the piece we cut out? I think it would make a great flower center for a different flower, maybe a floppy one that you could put a stem on and use it in a vase. I forgot to leave my email: banaszakv58(at)gmail(dot com) Sorry about that. Your project is over the moon, Maria! fussy cutting the flower out - whew! It turned out great! Can't wait to try the prills and fibers, they look so fun! I like the dimension of the prills and the glimmer of the fibers. So cool. I love seeing new products and finding inspiration. Thanks. Cool! Great new stuff for me to discover! 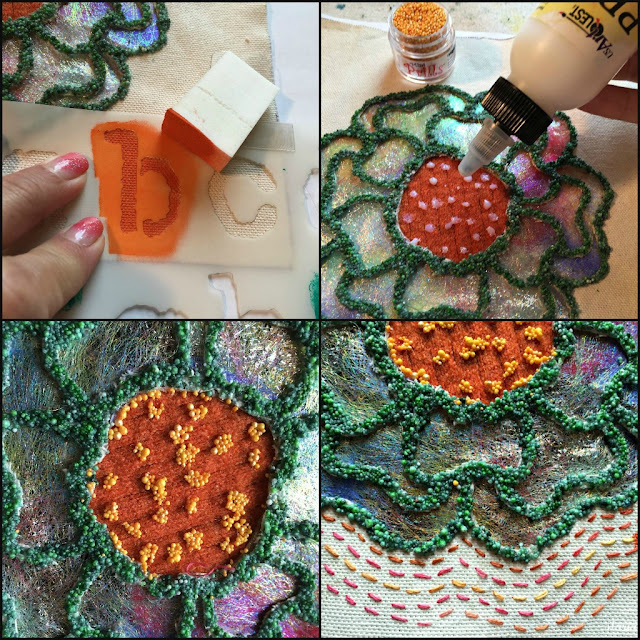 Hopping over here from Stencil Girl and the giveaway,.... I have GOT to try your Angelina technique you did here. Lovely!!!! Enjoyed your creating very much! Great texture!! Cool project! I loved al of the projects but I think I loved yours best! WOW! I haven't thought of such an amazing result! Love it! This flower is gorgeous. I love seeing your creations. Most people use grated cheese or fresh herbs to garnish food....Maria uses Dicrofibers!! And I see nothing wrong with that ;) Your piece is just beautiful. And the stitching is the perfect finishing touch. Love it! I love the flower stencil! Sooooo pretty! Sweetness! I love learning techniques! Pretty art! Nice! A new technique for me to try. 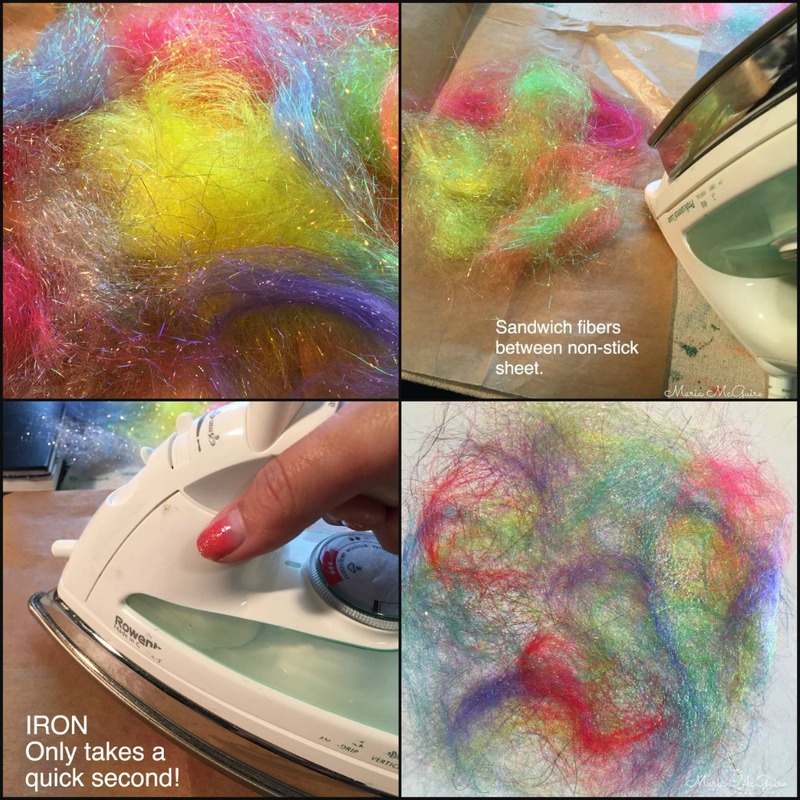 I've never been a real lover of fibers in mixed media but I really like the way you used them here. They create a nice watercolor effect! Wowsers!! 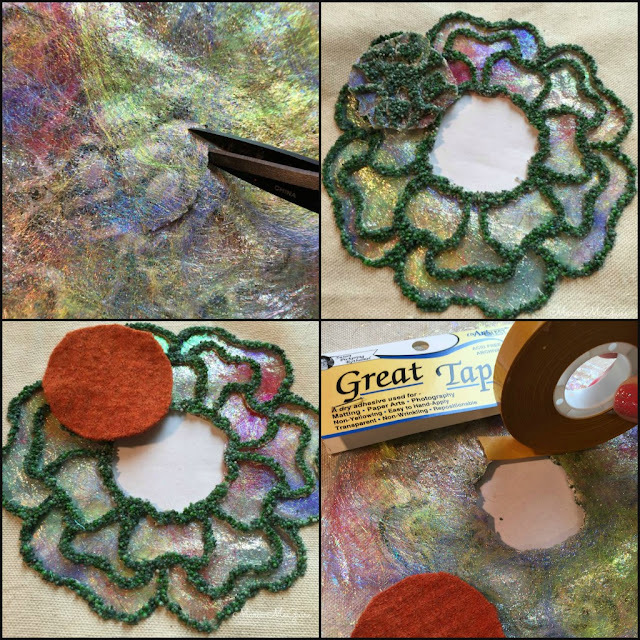 This is wonderful and loved your tutorial!! Great way to use the dicrofibers and prills!! Gorgeous! Love your step by steps and your journey to get to the finished product- love it! Wow Maria!! You really do go all out for the fun!! I love love, that fray check PPA stuff! Will have to check that out! And those fibers are gorgeous! Your tutorial is awesome- thanks so much for it- it helps to see how you achieved the end! And I always love your signature stitching- beautiful! I just love those colorful fibers. I have already visited ArtQuest to purchase some. I cannot wait to try them out using your inspiration, which I love. Than you. Love those fibres!! I don't like the ugly stages either, but yours turned out just amazing in the end. Great tutorial on how you got there! I love the colors you used in your project! I have the stencil you used and this project has inspired me! Thanks! This is so pretty! THAT STITCHING - love it! You know I loved stitching! Thank you for sharing and glad you had fun!